Rosie Jones welcomes us warmly with a glint in her eye, ready to tease the audience with her sparkling wit and juicy surprises. She’s willing to take a joke to extreme lengths, Borat style, with gleeful enjoyment in the social discomfort of others. The fact that she has cerebral palsy is not in competition with her comedy but rather forms a central part of the creative process, and she is a comic force to be reckoned with. As the audience catch onto her style, she builds on the anticipation of her jokes with pulsating fun and she visibly relishes the shrieks and giggles that meet every surprise comment. In the show she explores whether she would be funny if she were able-bodied Rosie with beautiful simplicity. She illustrates with utter clarity that every comedian brings everything that makes them them onto the stage, and any other comedian would struggle to make the same jokes as funny. Every once in a while a show makes a shift in your brain as you re-evaluate your assumptions. Hannah Gadsby did it last year and Rosie Jones did it this year. 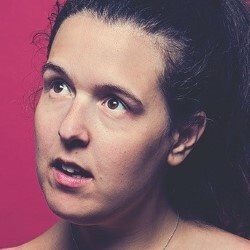 Catch Rosie Jones: Fifteen Minutes at the Pleasance Courtyard at 8.30pm until 26th August.